Hey everyone! When I was thirteen, I started this blog to talk about fashion, and it seems that I haven't wrote about actual trends in years! Of course, I have done ootds, but can I still call myself a "fashion blogger." Since my last fashion trend post (four years ago), I have been through a ton of trends to find myself. The worst being my time when I would wear galaxy tights underneath denim shorts, but let's not talk about the fashion don'ts! I, absolutely love Autumn (especially months September through November). I like the idea of wearing cute jackets with jeans, nice scarfs, faux fur coats, and knee high boots way more than I like shorts. This Summer I enjoyed wearing skirts and dresses though, so I might continue that style into the Fall. Today, I want to talk about my favorite Fall trends. I love turtlenecks. Last year, I bought two from Land's End, and I paired with everything. I styled outfits of pink skirts with a black turtleneck, tights, and knee high boots. 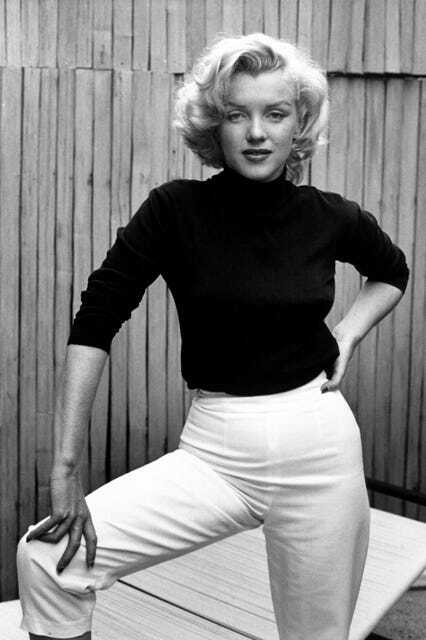 The trend of turtlenecks have been around for ages; we've seen Marilyn Monroe and The Beatles wear them. This trend looks classy and you can pair them with jeans, overalls, dresses that go over them (but it depends how thick the shirt is). Also, chunky turtleneck sweater dresses paired with tights and ankle booties is perfect for winter weather. Lastly, turtlenecks are SO COMFORTABLE. Last year, I literally wore them everyday because of the fact that they are usually made of cotton, and feel like pajamas. 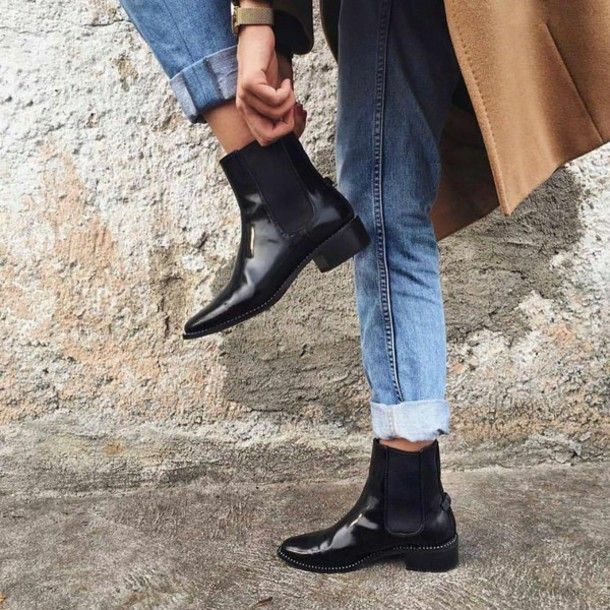 Ankle boots or Chelsea boots have been seen on celebrities like Harry Styles to models like Kendall Jenner. I, personally, adore this trend because 1) it's so easy to have a chunky heel that is comfortable 2) it goes with everything. My staple would be black ankle boots, but there are some colors like maroon and blue that also go with many outfits. Also, wearing ankle boots gives you the excuse to wear knit socks that are taller than the boot and match it with either tights or a dress. 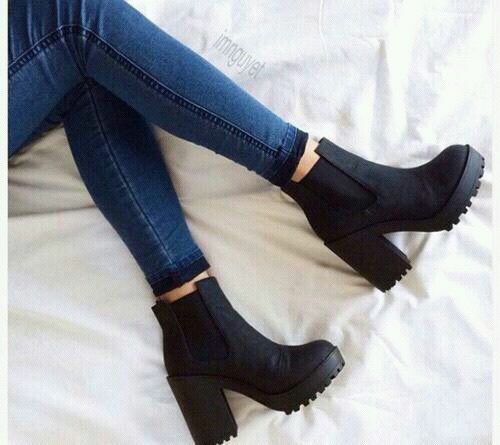 As shown above, you can also pair black ankle boots with jeans. How could you go wrong with this fashion staple? Paper Bag Waist Pants are definitely one of the newer trends that I really like. Pants, like these, are sold at stores from H&M to Stella McCartney. There isn't much freedom when it comes to styling these pants, but not every article of clothing needs 10 ways to style. These pants would go well with either heeled sandals (if it's warm enough out) or chunky ankle boots. With the two photos, the pants are styled with white shirts, but is always subject to change with the color of the pants. I like the style of tucking in the shirt because it makes the outfit look classy enough for a work day or just to dress up. The pants are stylish, but comfortable. This year, I hope I can get myself a pair of these pants. I hate REAL fur because I don't believe in killing animals for their fur. But, FAUX fur sign me up all the way. Last year, I bought a purple faux fur coat from Forever 21 for about $55 and I was so obsessed with it. You can see me wearing it back in an OOTN from last December. I find faux fur coats to be so fun, especially when they are in different colors. Also, if you style the coat well, then it can go with so many outfits. For formal events, you can wear it over your dress and pair it with heels. But for a day out, you can pair it with jeans. It's perfect for the Fall because usually faux fur coats aren't heavy, but it'll still be warm enough out to wear them. Once again, it's a cute look and no animals are killed in the making of it. I think blazers are great. When I was in middle school, I bought a blazer at Century 21 and I wore it with everything to make it look fancier. I recently bought the blazer on the right for $50 from Century 21 and it's Tommy Hilfiger. I saw the same jacket at Macy's for $82, so now I feel a bit better for how cheap I got it. I bought the blazer because I will be joining the Congressional Youth Cabinet of New York in September, and I felt I needed it for the occasion. I might do a post about how I style it because currently I am planning on wearing it with dark jeans, a white shirt, and black boots. Blazers in general can turn a casual outfit into a formal-business outfit very quickly. You can wear blazers over dresses, with pants (maybe even the paper bag waist pants). This is definitely a staple to have in your closet for the Fall. 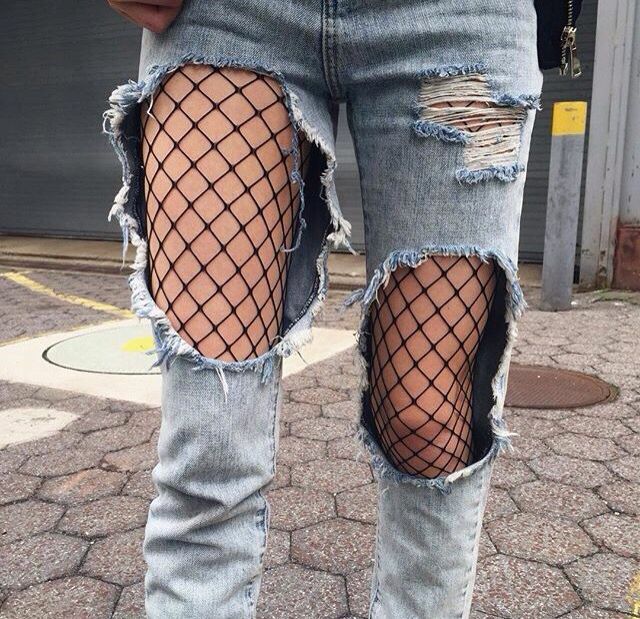 First of all, I included the image of the jeans with the fishnets underneath them because I love that style. I have yet to try it, but this Summer I saw the trend so much. Secondly, jeans are great. My recommendations for good jeans are American Eagle, Topshop, and Hollister. Out of the three, I prefer American Eagle the most just because their jeans fit so well, and come in a variety of styles from high waisted to boot cut. Also, their jeans are pretty affordable. Topshop is a bit pricey, but 100% worth the investment. I own the Jaime jeans from Topshop, and they were $80, but I wear them all the time. Jeans are so easy to style, and they go with everything from t-shirts to chunky sweaters. Also, you can wear almost every type of shoes with jeans. I just really like boots, okay? I recommend if you are going to buy knee high boots go to Steve Madden. At the moment, all my shoes are either Adidas or Steve Madden, and I have no regrets about that. Steven Madden shoes are so durable, and you can get them cheaper in the Fall (student discounts sometimes! ), and at the outlet stores. High Boots are so fun to style with dresses and cardigans. I don't like wearing them with jeans, so tights usually is the way I go with them. Once I start wearing scarfs, I know its officially Autumn. 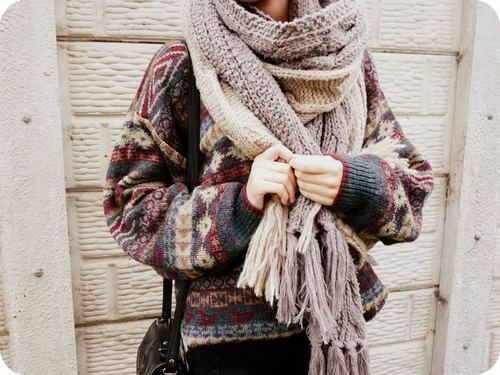 Big, chunky scarfs are good to match with sweaters (as shown above) or with dresses. Scarfs are good to wear on chilly days, or to make a plain outfit look a bit more fun. The trend carries on into Winter, so it's six months of styling scarfs! Adding a scarf can change a whole outfit, and it's a subtle accessory. Questions: What are your favorite fall trends? Do you have any of the same as mine? I am in such agreement with you on everything here!! turtle necks and ankle boots are a must & dressing up all cozy in scarfs and coats ahhh I'm so excited. It's honestly my favorite season! I couldn't even wait to post about it, haha. I swear every trend you have listed are the reasons why I love fall so much !! My favorites are definitely the over the knee boots and also one that you didn't list are oversized sweaters because they are just so cozy! Ah! How could I forget oversized sweaters! I love those too. I can't wait to fully wear fall styles! yasssss lady, turtle necks are the way forward! especially as it's starting to get colder here in england at the moment, i've pulled all mine back down from the attic and can't wait to get snuggled up in them! i also love paper bag waste pants (but had no idea that's what they were called!) they make any outfit look effortlessly stylish and they're soooo freakin' comfy! I just love autumn shopping. There are so many choices to choose from and so different weather. I love to change my style everyday just to look chic.